Designed for those guitarists who desire this unique form of modulation. Carl Martin is doing a groovy thing out there man. The Vintage Flanger has four knobs to control Speed, Depth, Pre-delay and Feedback, plus a dual speed mode that is foot-switchable. 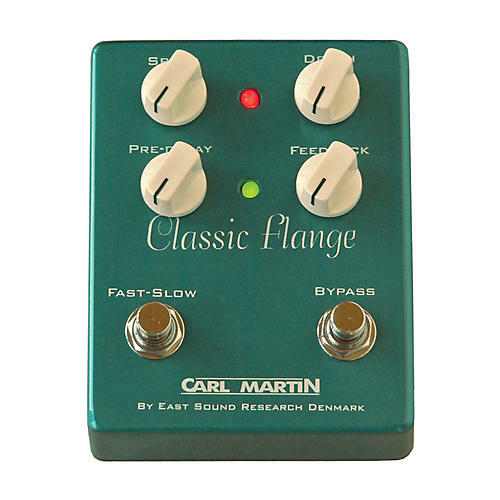 There are no rules with a Flanger, just plug this versatile modulation pedal in and play. As with all the Vintage pedals, the Flanger comes in a solid, diecast housing with the cool CM graphics and chicken-head knobs. It can be powered by 9V battery or a (recommended) regulated 9V power supply like the CM Big John. Get in the groove. Order today!